Becki Newton (C'00) is back as Amanda on ABC's Ugly Betty. Rob Forman (C'06) is encouraging everyone to watch Big Shots (the show he works for) on ABC. Check your local listings for times. Watch out for Liz Banks (C'96) to return to Scrubs this season as JD's (Zach Braff's) pregnant girlfriend, Kim. Mark Cronin's (Eng '86) America's Most Smartest Model debuts Sunday, October 7 on VH1. Check your local listings for times. Director/former Thirtysomething star Ken Olin (C'76) continues directing ABC's Brothers and Sisters. Also on the same show is writer Sherri Cooper Landsman (C'94). Writing partners David Guarascio (C'91) and Moses Port (C'91),(former co-producers and writers of Just Shoot Me and 2001 "Penn in Pictures" panelists) debut their CW show, Aliens in America Monday, October 1. Check your local listings for times. Joey Volpe (W'09) recently emailed me to let me know that he worked on The Bachelor this summer and that we should all check it out on Mondays on ABC. In addition to America's Most Smartest Model mentioned above, Mark Cronin (Eng '86) also has another 2(!) shows: I Love New York 2 on Monday nights at 9 pm on VH1 as well as Gotti's Way. Check your local listings for times. Starting on February 11, Mark Cronin's (Eng '86) Flavor of Love 3 debuts on VH1 at 9pm. As reported earlier this week, Stephanie Lemelin (C'01) stars in the ABC comedy, Cavemen Tuesday, October 2, 8 pm (check your local listings). Will Frank (SEAS'06) appears as one of the "geeks" on this season's Beauty and the Geek. Check your local listings! Joel T. Newman (C'04) appeared on Discovery Channel's Cash Cab and won! Penn alumnus Melissa Rivers wins big on Celebrity Family Feud! Charlie Herschel (C'01) appearing on Survivor: Gabon this fall. CBS has ordered Mike Sikowitz's (C'88, Sigma Alpha Mu) pilot called My Best Friend's Girl - A comedy series about a guy who falls in love with his best friend's ex-wife. Mike's credits include being a writer/producer for The Class and Grounded for Life. A few years ago, my (former) writing partner and I attended the pilot taping of a show Mike had called Grown Men - a single-camera comedy about a group of five frat brothers who meet up at a friend's funeral. I really liked the pilot but it wasn't picked up. 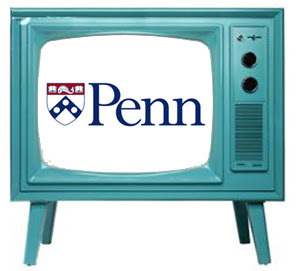 Alumni out there, do you have something on the TV Schedule? Add your comment below! Right now I’m working in NY as Supervising Producer for Paranormal State on A&E - Season 2 starts airing in July. And recently finished a Series Producer gig for Suburban Secrets on truTV (produced out of DC) that starts in the fall. Certainly willing to help Penn folks looking for contacts – esp. in DC!